What is really the story behind Daishoji Imari ? There are many myths and varied opinions. On the Gotheborg Forum, this has been the subject of some disagreement/debate/controversy. Perhaps it is the creation of just a very good marketing strategy originated by one or a few clever dealers. As background, Georges Bouvier and John Wocher spent in November 2016 three full days in the heartland of Kutani, meeting with dealers, shops attendants and shop owners, decorators and potters. For those who would like to just buy a copy of Imari, buying a Daishoji Imari piece or even a Kaga Imari piece might be much more rewarding for the buyer who believes he is purchasing a particularly rare item and also the seller benefits and can nicely increase the price. There are many arguments but the facts might be very simple. 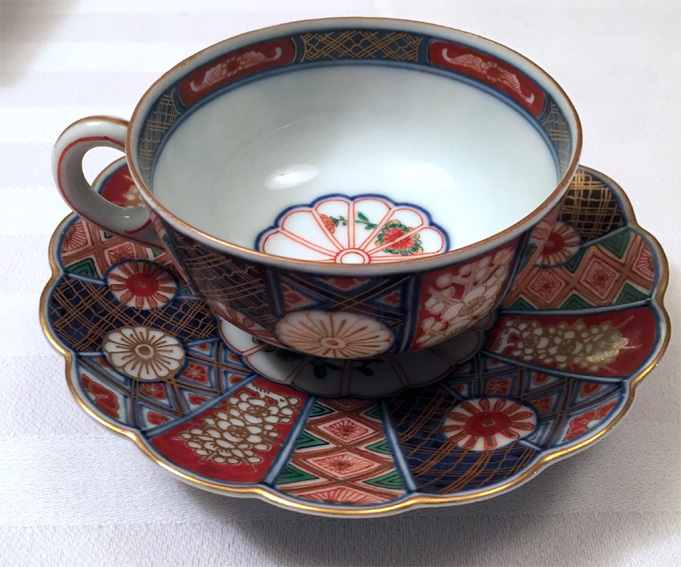 Imari production was the first popular since the early days ,and it was exported widely but also sold massively in Japan. Kutani has always been a local and an exclusive production, and beside the peak export production in the Meiji period, it has always been far behind Imari in terms of quantity. Kutani kilns have always produced copies of Imari, as there was a demand for these types of wares. They did exactly the same for copies of Korean or Chinese wares. This is not surprising, as it was a good business. But the difference came after the war when a few local dealers and kilns from Daishoji, in trying to maintain their activities, found out that there was a market for pieces of good quality with Imari motifs. They had many good painters in the Daishoji area which has always been the center of Kutani production. We define Daishoji more widely than the township known by that name today, understanding it encompasses the area containing Terai, Sano, Nomi, Kaga, Komatsu and the like. Daishoji refers to the clan that controlled this area and it has a much more romantic and historic image that fits well with the marketing effort for these pieces. In producing these wares, one problem was to get a good blank especially whiteness. There are not so many blank producers around Daishoji, except for the Bansko kiln, Higashino kiln, Juraku kiln, Bitoen and so forth but they had all the same problem. The clay available in the wider Daishoji area was not of a superior quality. One solution to evolve is to mix the local clay with higher quality material. We have been told by several of the above kiln owners, some being over 80 years old that special clay was not only imported from Kyushu (Arita), but also Korea and even China. You do not need so much and it looks like it is not a secret! We saw rocks, powder and clay from all three areas in the major blank producer in Komatsu. 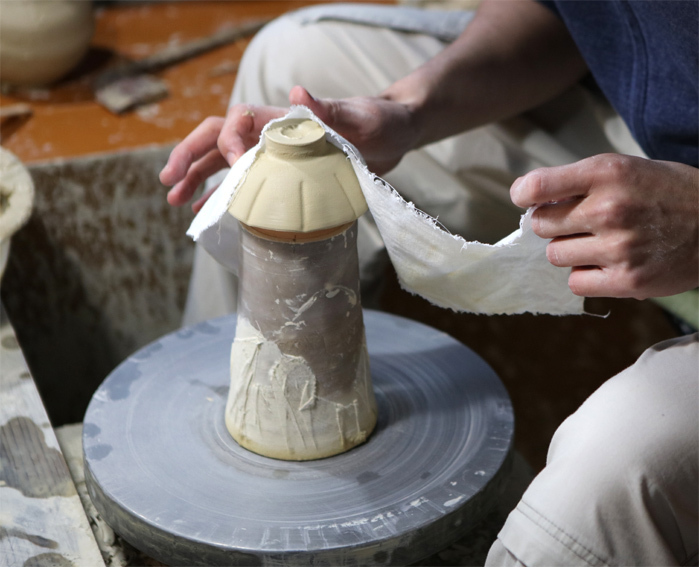 We saw it mixed and thrown on a potter’s wheel and turned into a vase to be glazed. In fact, this producer of these blanks supplies them to Fukushima Buzan and Yoshida Minori (who is a Living National Treasure) as this is written. We were given two large blanks rejected by Yoshida Minori because of minor kiln firing flaws. Originally we were very skeptical of the transport of Arita clay material to Kutani. We are now convinced beyond a doubt. The important point was to have superior quality pieces so the price of little clay may have not been so important. If imported in powder form, not so heavy or bulky, but we think imported in both forms. The difficulties come because the pieces have to be reasonably decorated, fashionable, and therefore had to bear the typical Chinese reign mark which make these pieces very difficult to recognize when compared to the original Imari production. On the other hand almost all the pieces made in the Kutani area have a very similar design based on the petalled chrysanthemum motif. The question of the kodai or foot of the bowl is also rather simple, as you have a few handful of potters who supply all areas and each one is doing as he feels, but generally we understand that there is always an angle, it makes it easier to handle the piece for glazing. On our trip we saw inside out, outside in, fully glazed, unglazed and rounded kodai. Most common, however, was an angled foot rim. By chance among the local production with a Chinese reign mark we can find indifferently some pieces with kutani marks with kaku fuku or running fuku. We have strong evidence as we spend a lot of time with Madame Teramae, the owner of Bitoen, an 82 year old lady who remembered very well the Daishoji Imari production days. They produced thousands in the 1950’s and we saw many. 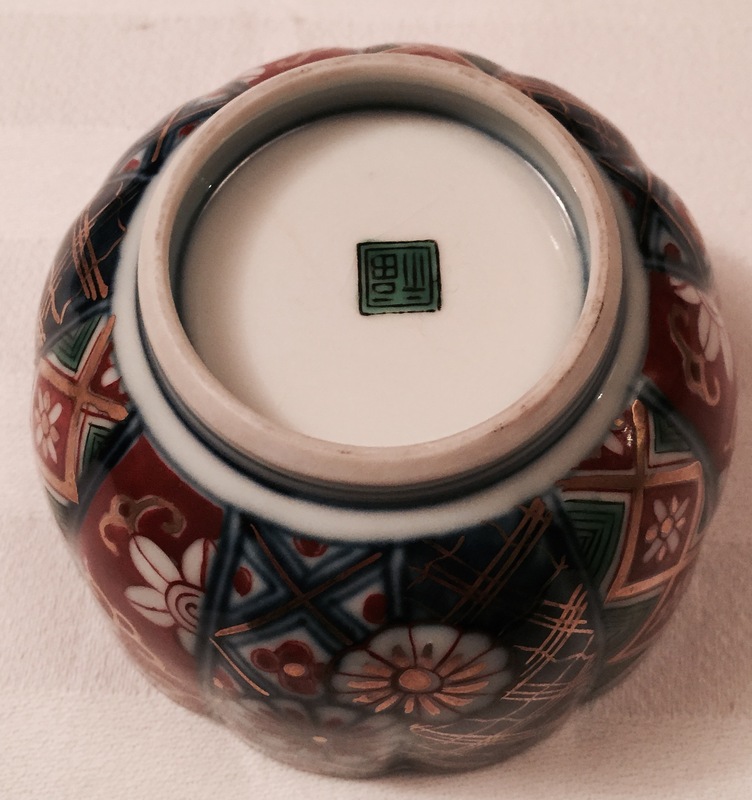 We even enjoyed dinner using her Daishoji Imari marriage diner set she received from her father in law in 1957. Georges purchased from Bitoen in 1998 an Imari style dish produced by Bitoen in the 50’s which has a kutani Eisho mark. Eisho being the pen name of Teramae san’s husband. During peak production in the 1950s, Bitoen had 25 full time employees and a large number of decorators. They did everything from blank formation using mixed clays, to underglaze Chinese markings, glazing, overglaze decoration and gilding, firing everything in-house. We believe Inoue Shoten was a similar operation. Now what happened and why did this production stopped? Rather understandable, end of 50’s, the market turned down, the demand for high quality pieces disappeared when at the same time the production of Imari and other Koransha with a highly mechanical production at low cost and poor quality increased. High quality material was replaced by ceramics for everyday use. In fact such production period of Daishoji Imari did not last too long. Bitoen has not produced for a long time, and Inoue Shoten no longer exists. 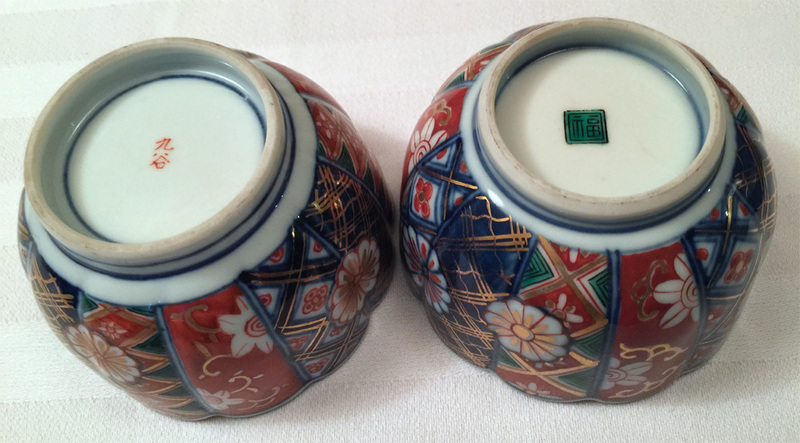 But we also found out that few companies have continued or are still producing today these types of Imari, so be careful! A good example, we went to a very famous kutani antique shop in Kanazawa, and a beautiful Daishoji Imari set was there for sale among the other antiques. When we asked to see them in our hand and get some explanations we were told that it was a Meiji production and the price was accordingly in line! As we were very much dubious on the date we kept asking question and finally the lady told us she had a wooden box. We were delighted to see the accompanying tomobako but looking at the box it looked brand new. We opened and found plastic protecting bubble sheets …..and the producer history with a 1960 date!!! Nothing to do with Meiji period. One must always question this! So unless you get Daishoji from a reliable source, be very careful as it is very difficult to differentiate and date these pieces. A last note: Both Georges and John disagree with the term Daishoji Imari, as misleading. As a style, perhaps, since it has crept into our lexicon over the years. These pieces are simply Kutani copies of Imari patterns, one in particular very widespread, no more, no less. 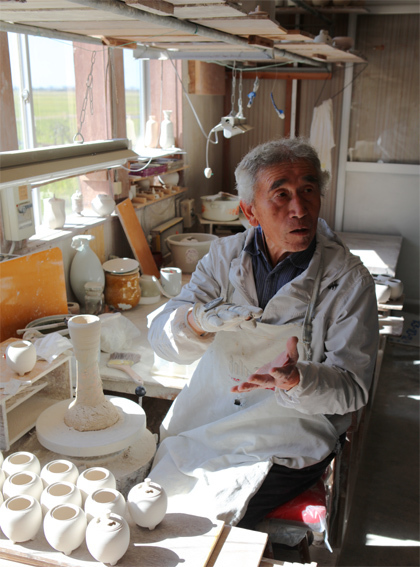 Mr Shimomichi Ryohei, the 82 year old owner of the Bansho kiln, producing blanks for virtually everyone and for Kutani copies of Imari patterns as well. 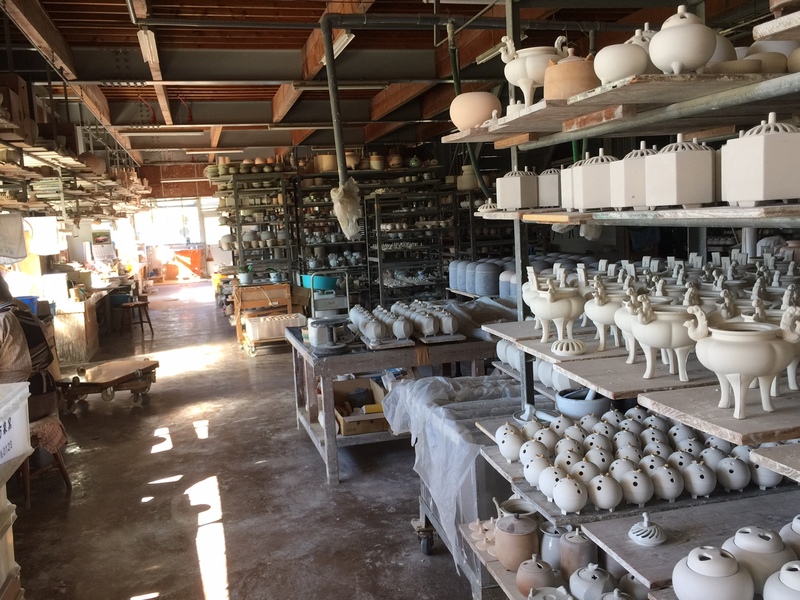 The pieces awaiting glazing and firing, or waiting for underglaze sometsuke before firing, in Komatsu.